While we may be enjoying the beautifully warm and bright Spring weather, it’s still too cold to sow our vegetables directly outside. It is, however, the perfect time to start them off indoors. This year I made my first sowings just before Easter (end of March), the year before that it was in mid February. Ok ok, so I’m new to blogging, it’s taken me this long to tell you that! But it’s still not too late now to start sowing to get a harvest of vegetables in mid summer. Here in Oslo the (frost-free) growing season is relatively short (May-October- ish). So rather than wait until it is warm enough to sow directly outside, you can extend the growing season by sowing seeds inside first. Once the soil has warmed up sufficiently and risk of frosts have passed, you can transplant them outside. Certain vegetables will prefer to be sown directly outside, carrots for one (but there’s nothing to stop you trying!) but for the most part this can be done with most vegetables. When potting up, I have found it helps to add some vermiculite to my potting compost (usually called here ‘så/kaktus jord’), to lighten the soil even further, about at a ratio of 1:2 (soil). 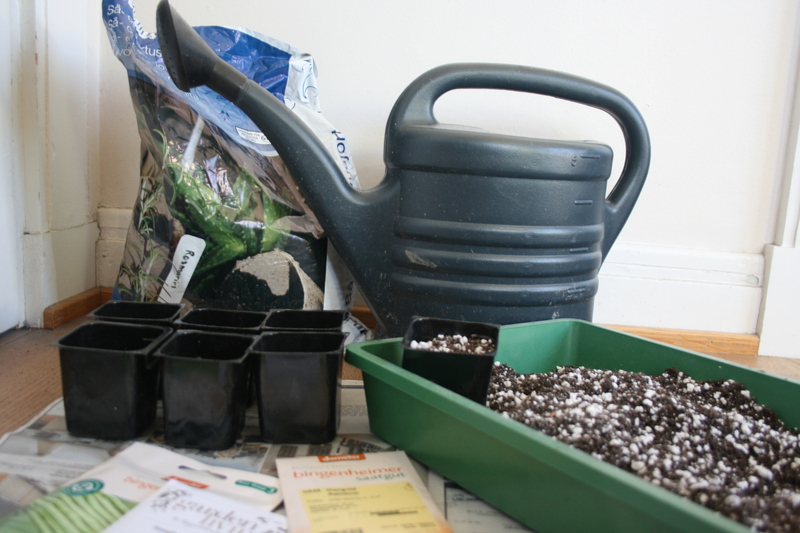 My pots were reused lego packaging and I sowed a 1-3 seeds in each individual pot depending on the size of seed. Then I put them in a small propogator and gave them a good watering with a watering can with a sprinkler head (turned up so the water comes out more gently), before putting the propogator lids on and setting them on the window sill. You don’t even need a propogator: a pot with a clear plastic bag over the top secured around the pot with a rubber band will do the job just as well. Adjust the ventilation or loosen the band if too much condensation is forming. Amazingly within the first week, there were first signs of sprouting seeds. A few weeks on, some of the seeds were ready to be potted into bigger pots – below are the beans racing ahead! As you can see they are straining for light so I have made a reflector using cardboard from a cereal packet and some kitchen foil. Placed behind the plants it reflects the light from the window and provides another light source so that plants don’t end up leaning towards the one. 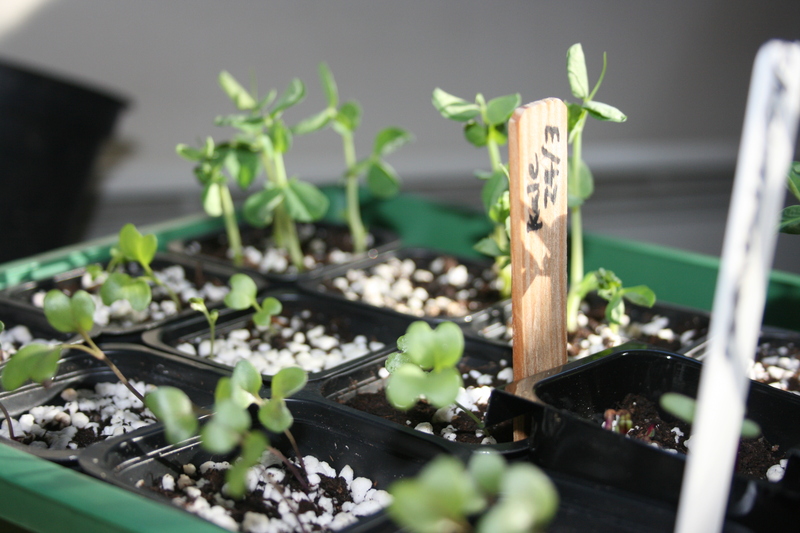 Whilst these seedlings are getting bigger, it’s time to sow another batch. 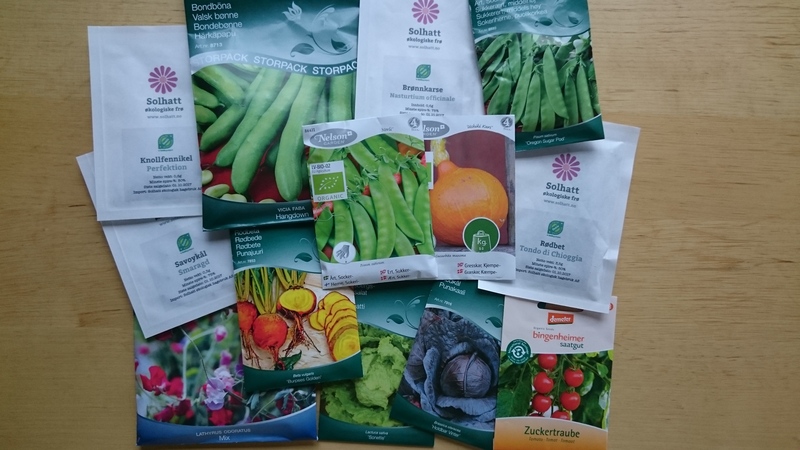 By keeping some seeds back and sowing again a few weeks after initial sowing and so on, you get the bonus of later harvests, thereby potentially giving you a continuous harvest throughout the growing season. Categories: Food growing | Tags: foil, seeds, sowing, vermiculite | Permalink.